It’s hard for most of us to imagine what our lives would be like without cell phones. For all its oft-debated vices, no one can deny cell phones have made our lives a lot more manageable. No matter what corner of the world they may be in, family, friends and colleagues are always just a few swipes and clicks away. Keeping up-to-date with global events has never been easier. Moreover, cell phones are a 24/7 entertainment package providing on-the-go access to various social media sites, video channels, high-quality graphic games and applications to suit varied interests. Cell phones became an intrinsic part of our lives around 2009. By 2014, the global subscription rate of cell phones reached a whopping 6.9 billion, as reported by the World Health Organization (WHO). Cell phones cannot be all boon and no bane. Excessive use of cell phones, especially at bedtime, is a global habit with significant negative effects. Out of 1,656 adolescents in Belgium whose nighttime cell phone-usage patterns were assessed, only 38 percent did not use their cell phones post lights-out, according to a 2007 study published in Sleep. Electromagnetic radiation from cell phones is a major cause of insomnia, anxiety and other psychological disorders. Stress, symptoms of depression and sleep disorders were positively associated with high mobile phone usage in 4,156 young adults (20 to 24 years old) over the course of 1 year, according to a 2011 study published in BMC Public Health. Out of 337 students whose cell phone usage-patterns were assessed, a significant number (especially females) reported high anxiety and insomnia, according to a 2007 study published in Addiction Research and Theory. In a 2013 study published in Community Medicine and Health Education, the cell phone usage patterns of 459 college students (17 to 23 years old) were assessed for 2 months. The study states that 51.5 percent reported frequent headaches/migraines, 50.8 percent reported anger and irritability, 47.4 percent reported a lack of concentration, 38.5 percent reported anxiety, 36.5 percent reported eye strain, 35.4 percent reported sleeplessness and 32.7 percent reported tiredness. Cell phone radiation also negatively affects reproductive health. High cell phone usage was directly and significantly associated with a low sperm count and overall infertility in 361 men undergoing assessment at a clinic, according to a 2008 study published in Fertility and Sterility. Furthermore, WHO’s International Agency for Research on Cancer declared cell phone radiation as a possible carcinogenic. However, further studies are required to substantiate this claim. As cell phones take the lead as the primary means of communication, giving them up altogether is not a realistic option. However, we can take certain measures to minimize the health damage of cell phone radiation. Here is a list of things you should be doing now to protect yourself from cell phone radiation. Your cell phone emits electromagnetic waves directly near your head when you hold it up to your ear. The farther that you can keep your phone away from your head, the safer you will be. Although talking on speakerphone can get a tad annoying if you are in a public place, it is a surefire way to minimize the risk of radiation directly harming your brain and triggering countless psychological disorders. Sometimes, there is no way you can avoid talking on the phone, and that is okay. During emergencies and many other situations, talking on the phone is necessary. The key to minimizing radiation damage is to identify situations when a text will suffice and use those opportunities in favor of your safety. Often, we are too lazy to type. We feel we are wasting time typing out a message that could be communicated much more quickly over a phone call. However, you must resist these urges and text your way to better health. 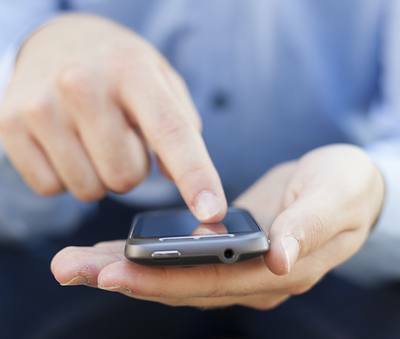 To make it easier, explore the options on your phone for dictating your text messages instead of having to type them. When talking on the cell phone, your voice travels via the antenna in the form of radio frequency radiation, the exposure to which is also increasingly harmful. A hands-free device significantly reduces radiofrequency radiation to the head, according to a 2003 study published in Radiation Research. A headset wire is also capable of picking up a certain amount of radiation and transferring it to your head, although significantly less than when using a phone. Make sure you purchase a headset with a ferrite bead installed. A ferrite bead is a hollow, semi-magnetic bead attached to a headset wire that absorbs radiofrequency radiation. Cell phone radiation can be avoided using a ferrite bead with the correct fit, sizing and placement, according to a 2014 study published in the International Journal of Pure and Applied Research in Engineering and Technology. When you are in a remote area, your phone has limited to no access to cellular towers. Therefore, when you attempt to make a phone call from the middle of nowhere, your phone emits excess radiation trying to catch signals to send your call through. This ends up exposing you to hazardous radiation. In a 2004 study published in Occupational and Environmental Medicine, all phone calls made via a particular service operator from four different areas (rural, suburban, small urban and city) were recorded over a week. Results showed that in rural areas, the lowest power level was used only 3 percent of the time while the highest power level was used 50 percent of the time. In urban and city areas, on the other hand, the corresponding figures were 25 percent and 22 percent, respectively. The same logic applies here as well. When you are on the move, it is harder for your phone to connect to cellular towers and boost signals. For this reason, it has to produce even more radiation to achieve connectivity. This exposes you to even more harmful radiation than average. Furthermore, the deflection of the radiation against the metallic parts of the insides of cars, trains, buses and elevator walls can further exacerbate the effect and increase exposure within those confines. Also, avoid using your cell phone in the basement. Studies have shown that cell phones are capable of affecting not just your brain, but also your reproductive organs. An overall decrease in sperm production was found in men who used mobile phones regularly, and an abnormal sperm cell production was reported in men who had been using GSM phones for 1 to 2 years, according to a 2007 study published in the Annals of Agricultural and Environmental Medicine. Often, we place our cell phones on our laps after using them. A lot of us frequently slip our phones into our pockets without turning the screen off first. Our phones light up while in our laps or pockets when we receive calls. These are additional ways we are exposed to radiation. Keep your phone away from your body as much as possible. Also, consider using a cell phone case to protect yourself from further exposure. Yep, going old-school has its benefits. The convenience of mobile phones has made couch potatoes of us all. The mere thought of getting up and using the landline every time we need to make a call is an arduous feat for most of us. However, remember the health benefits of minimizing cell phone radiation and diligently use the landline instead of your cell phone whenever you are at home, or wherever you have the option to do so. Keep in mind that a cordless phone, too, will emit radiation and is not the same harmless option as a landline phone that has a cord. Opt for a service provider that lets you forward your cell phone calls to a landline number to ensure you use the safer option when you are home. 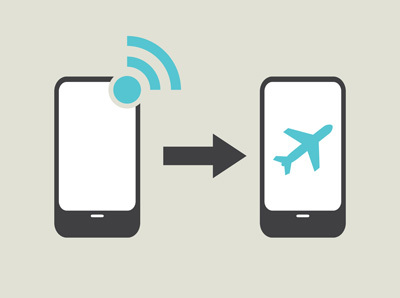 Put your cell phone in airplane mode to limit contact, and consequent radiation exposure, whenever you can. You can also choose to turn off your phone to protect yourself from unwanted radiation when you have no choice but to carry your phone in your pocket or if you are sleeping with it next to you. This is a pretty simple tip to minimize cell phone radiation. 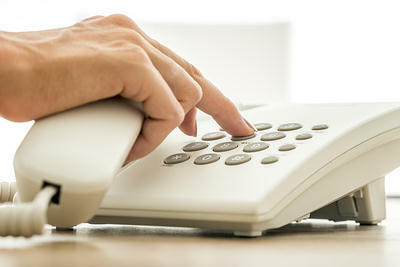 When you are initiating a call, keep your phone at a considerable distance and wait for your screen to inform you when it stops “dialing” and achieves “connection” mode. There is no need for you to put your phone on your ear and absorb the harmful radiation while the phone rings. Only do so when it connects to the other person. While on a call, alternate holding the phone between each ear to allow yourself some microseconds away from the phone. This is a great complimentary practice if you are already taking necessary precautions to minimize cell phone radiation-exposure, but still need to take phone calls now and then. Often, you might find yourself in too much of a hurry to plug in a wired headset, or in a public space where you lack privacy or do not wish to disturb others by using the speakerphone. In such situations, switching sides is your best option to minimizing radiation exposure. Eat As Much As You Can: This Plant Contains A Powerful Substance That Kills Cancer Cells!